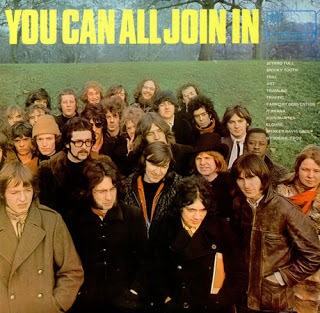 Released in 1969, "You Can All Join In" was the first of the samplers released by Island Records, and arguably the best. The vinyl disc was roughly half the price of regular albums but in terms of quality showcased some of the most exciting bands to be emerging at the end of the 60s. From its origins as an importer of Reggae music, Island Records had became one of the most interesting independent labels of the time and introduced the record buying public to some of the most original acts around. The album cover features various figures from Island Records, all looking somewhat the worst for wear as they pose in Hyde Park. Check out the Wikipedia entry for exactly who they were. All the tracks made it from vinyl to CD, and are also included on a 1992 CD entitled "Nice Enough To Join In". The complete track listing of the original album is here.